Industry trend: high end compounds and fiber reinforced compounds gradually replace metal in automotive parts.Engineering plastics and thermoset materials have already succeeded in replacing metal in multiple markets. The key driver for this substitution is weight reduction and, consequently, lower fuel consumption for vehicles of all types. Whilst carbon fiber reinforced epoxy FRP can account for up to 50% of the structural weight of a state-of-the-art, fuel-efficient airliner like Boeing’s 787, the automotive industry is probably the sector of the transport industry with the highest count of metal replacement projects using high performance or high stiffness polymers. Metal still accounts for 70% of materials used to make cars, plastics for 22%, the remaining 8% being “other materials” mostly glass. The breakdown of plastics in 2012 was reportedly 44% Polypropylene (PP), 13%polyurethane and 9% Polyamide (PA). A great deal of those polyamides are long carbon chain polyamides coming from oil plant based chemistry like PA6/10 and PA 10/10 (DUPONT Zytel™RS) and PA 11 (ARKEMA Rilsan™) derived from castor oil. Several different reinforcing systems have been developed to compete with metal. In some cases the tensile strength and flexural modulus of highly reinforced polymers can even beat those of metals. In the future, the use of engineering plastics needs to be smarter to allow for even more advantages than mere weight reduction: function integration, easier manufacturing processes, more flexible production lines, fewer components and less assembly operations, and, last but not least, sustainability are among the usually requested functionalities and advantages. Engineering plastics producers carry on finding new formulations to keep up with the cahier des charges of the automotive parts manufacturers who, themselves, receive specs from automotive manufacturers racing to market lighter, greener, smarter and lower cost cars. These metal replacement projects are also a good opportunity for the plastic industry to generate new growth and to raise margin levels. This is paramount to compensate for other more mature applications and market segments losing ground to cheaper resins like reinforced polypropylenes (PP). PP compounders find opportunities in developing higher performance PP based compounds to compete with more expensive long carbon chain polyamides (PA). Such PP-based compounds are not only built on a cheaper base resin than PA and other engineering resins, they also bring reduced density to the application, which means lighter weight parts. Hemp fiber reinforced polypropylene is an example of such a path to reinforce the mechanical properties of a low cost polymer, enlarge the scope of its applications in cars, and compound up to 30% of bio-sourced fibers with a so far petrochemical commodity resin. Metal replacement projects are therefore becoming more complex; requiring advanced manufacturing technologies as well as new polymer and compound formulations. One of the most significant economic advantages of plastics, beside the weight reduction they offer, is the ease of manufacturing and short cycle times they offer. Thanks to this excellent compatibility with the need for high volume output at the most competitive costs, plastics have been widely accepted by the automotive industry. This industry has grown with plastics; it also made plastics grow like no other industries had. This love story keeps going on, as there remain many applications in metal, and carmakers keep on reducing weight to allow for new functions and parts to be added to make cars safer. Again, besides reducing part weight by using plastics carmakers also add functions thanks to the design freedom of plastics. This allows for multiple components systems to be designed with much fewer parts. One of the most recent polymer made available for metal replacement in engineering application is Polyether ether ketone (PEEK), a colorless organic polymer thermoplastic in the polyaryletherketone family. Because of its robustness, PEEK is used to fabricate items used in highly demanding applications. These applications in mechanical systems include bearings, piston parts, pumps, HPLC columns, compressor plate valves, and cable insulation. It is one of the few plastics compatible with ultra-high vacuum applications. PEEK is considered an advanced biomaterial used also in medical implants. Solvay Belgium already has very high performance materials in its portfolio like its KetaSpire® and AvaSpire® PEEK (Polyether ether ketone) based materials. Such high end products are already widely used in metal replacement projects, like on these high temperature gear wheels made of KetaSpire® KTN-820 NT. Used in all kind of mechanisms the high performance plastic gears do not simply bring weight reduction when compared to metal. These gears are rather small parts, so the weight saving would not be significant anyway. 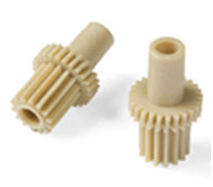 Plastics also bring many other strong advantages to gears like the use of internally lubricated grades, which avoids using external grease or oil. Vibration and noise reduction are also among the most important improvements of plastic gears. When tight dimensional tolerances should be matched, machining is much easier with high performance plastics compared to steel based gears. Another PEEK producer, Victrex, UK launched at K2013 a new product range featuring extreme mechanical resistance aiming at replacing steel, brass and even titanium. Its new Victrex® PEEK HMF uses a proprietary formulation including high modulus fibers. This new PEEK formulation is claimed to save up to 80% on part weight when it replaces metal. The long term use temperature for this new Victrex® PEEK HMF material can go up to 260°C. Announced on February 2013 this PEEK-based compound is said to efficiently compete metal in some of the most extreme applications like aircraft system attachments, industrial machinery and medical equipment. The two examples above illustrate a continuous search for performance that smartly combines organic of plant fibers to organic polymers. Another continuous struggle of the automotive industry and its suppliers is to replace fossil based polymers or pre-polymers by bio-sourced substitutes. To be adopted for manufacture of such parts and components, bio-materials, and for what concerns our specific interest, bioplastics need to be conducive to intensive processes such as injection molding and extrusion. ABS (acrylonitrile butadiene styrene) is an important plastic suitable for extrusion and injection molding. Its high strength and durability make it a useful plastic for manufacturing of many kinds of plastic parts where consistent performance is crucial. Butanediol (BDO) is an important input for the production of ABS and thus has become a target for makers of bioplastics. Plant-based materials are making their way into such high-performance applications as automobile tires. Green chemistry firm Genomatica (USA) develops fermentation-based manufacturing processes for producing intermediate and basic chemicals from renewable feedstock. Its first production objective is to manufacture a sugar-based BDO, with butadiene as its second target chemical. Early 2012, Genomatica signed a deal with Mitsubishi Chemical Corporation (Japan) to jointly produce BDO at commercial scale in Asia. Mitsubishi already manufactures petroleum-based BDO as a raw material for the production of plastics and elastomers. The announcement of Genomatica deal with Versalis and Novamont points to issues of supply as a key driver behind the move into plant-based feedstock. As a matter of fact fossil fuel derived BDO is a resource that is projected to become scarce and has shown a long term trend of price increases and a high volatility of those prices. Additionally ,the regulatory issues regarding the impact of using synthetic 1, 4 butanediol on the environment are acting as some of the major factors inhibiting the growth of global 1, 4 butanediol market. In order to minimize these concerns, the world is shifting towards development and commercialization of bio-based 1, 4 butanediol, owing to its environmental friendly nature. Replacing metal for car parts and components still remains a tough challenge and a multi-year R&D effort, even when it only deals with matching high mechanical resistance. But technology advances also bring significant competitive advantages to the companies running the engineered plastics and bioplastics race as they allows a business profitability significantly higher than lower cost — higher volume plastic products. This is a strong advantage in the current tough economic situation. In the case of engineering plastics, filing new patents protects all the investments made during the resin development project and the application development project for the part. As mentioned several times in the articles of this blog, most of the projects moving forward successfully result from alliances and collaborative partnerships between experts of each technology needed to build the new value chain from the plant to the engineering plastic part replacing metal, and doing the job or a better job at a lower total cost. Plastic materials are being utilized by many car manufacturers to help reduce fuel cost and also allow for durability. There have been many advancements in the recent years and this article just outlines that facts that it will continue to grow in the industry.